I started knitting socks in March 1997, getting ready to move from Texas to our little piece of land in Michigan when Zack retired from the Army. I had a 5 year old daughter who didn't remember cold weather, and who has very sensitive feet. I made a pair of socks for her. Since then, I've made four or five dozen pairs of socks for seven or eight people, with feet of various sizes and shapes, using both commercial and handspun sock yarns. I love making socks (did you guess?). They are fast to make and very rewarding to wear or give. I started with a pattern in a book and have since developed my own generic sock pattern that is based on your gauge and the size of foot you want to clothe. Yes, you need a good gauge s-s-s-s-swatch :) if you're not very experienced with the yarn you intend to use. But the results are well worth the time to make the swatch. From left to right in the picture: Sunset socks, Zack's chore socks, my first knee socks, and my new knee socks for when doing winter chores. 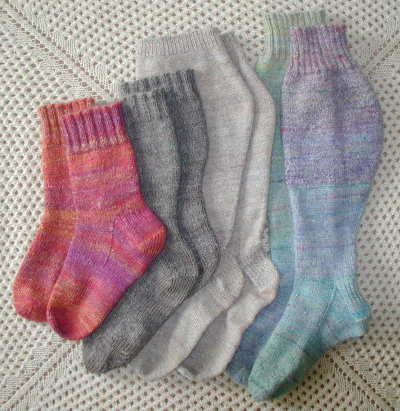 Each pair of socks shown here is made handspun yarn using layered batt techniques to make them more fun and interesting to spin and knit, even when the colors are dark and fairly well blended. But this pattern also works for commercial yarns. A sock is basically two tubes joined by a funky piece in the middle that makes it bend forward like a foot does--the heel. This explanation is for those who've never knit a sock, or really looked at a hand-knit sock. More experienced knitters can jump right to the pattern. First is the cuff and leg, all one tube, often knit on the same number of stitches. The cuff is usually ribbed for elasticity to help hold up the sock. The leg can be plain or fancy. With a little sock-knitting experience, you can substitute many stitch patterns for the usual stockinette stitch in the leg section. The heel flap comes next, which is fast and easy to work. Basically you're knitting back and forth on just half the leg stitches. Traditionally, heel stitch is used, but you can make your heel flap in any pattern that will fit the area! TURN THE HEEL! I have no idea why turning the heel has become such a scary thing to do. It's fast--the quickest part to knit of all the sock--and simple, if you follow the instructions here. When finished, it looks somewhat like a little triangle that has a blunt tip at the back, with the heel flap hugging the two sides and back. It's made with short rows in my pattern--there are lots of other ways to make heels, but this is the easiest to keep track of that I've found. Pick up the gusset stitches next. Picking up the stitches along the sides of the heel flap is easy to do--just make sure you have about one stitch for every other row, and pick up the same number on the other side of the heel flap. Next comes the foot. You might have gotten a little tired of the leg, then the heel and gusset gave you a nice break, and now you're ready to skim through the knitting of the foot, round and round without any construction details. Painless knitting! Finally, the toe is a simple decrease--again can be done any number of ways, but this method is less prone to wearing out than most. There! Breaking down a sock into its parts will hopefully clarify its construction and make it less intimidating to do. This pattern will free you from commercial sock patterns, and allow you to use the yarn of your choice, including handspun yarn. The key is a good gauge swatch and careful measurements of the foot you want to fit. The pattern makes standard ankle-length or slightly longer socks with unshaped legs, cuff down, on double pointed needles (though you can use circulars if that's what you like). On another page you'll find information on knitting knee socks that fit well and stay up. Knit a gauge swatch that's at least four inches / 10 cm wide; five / 13 is better for accurate measurements. Use the stitch pattern you plan to knit the leg in, unless you want the leg to be ribbed, in which case use stockinette stitch for your swatch. Choose a needle size that makes a dense knit cloth with that yarn, for the best durability in your socks. These figures represent a starting point for choosing yarns and needle sizes. They are not final--you should experiment to find what works best with your yarn and knitting style. Count the stitches and rows in four inches / ten cm centered on your swatch, and divide by four / ten to get your gauge with your chosen needles and yarn. Don't lose fractions of a stitch, you'll need those. Your stitch gauge is G and your row gauge will be RG. The needle size you used is M for Main needles, and you'll need at least 4 (5 is easier) double pointed needles in that size. You'll also need a set of 4 or 5 double pointed needles 1 or 2 sizes smaller to be R for Ribbing needles. Next, measure the leg you're knitting for. Use a flexible measuring tape and measure snugly but not tightly (don't dimple the flesh). You want the circumference of the ankle just above the heel, A; circumference of the foot at the instep, F; the height of the heel, H; and the length of the foot from the back of the heel to the tip of the longest toe, minus 1/2 inch, L. Write down all measurements and numbers of stitches or rows so you can repeat for the second sock. You can also, if you wish, use the sock record form I've devised for this purpose. Cast on A x G stitches, rounded down to nearest multiple of your ribbing stitch pattern, using M needles. Divide onto 3 or 4 dp needles. Change to R needles and work one inch or more in rounds of your choice ribbing or other elastic, non-curling stitch. Change back to M needles and continue in stockinette stitch or your pattern stitch to desired sock length from the beginning of the knitting, generally around 6 inches for adult-sized ankle socks. Or continue in ribbing on R needles if you want the entire leg to be ribbed. Place 1/4 of stitches on one needle, 1/4 plus one stitch on another. These will be the instep stitches. The remaining stitches, half of the total minus one, place on one needle. These are the heel stitches. Row 1 (right side): Knit 1, *knit 1, slip 1 with yarn behind. Repeat from * across row to last stitch, end knit 2. Turn work. Row 2: Knit 1, purl to last stitch, knit 1. Repeat these two rows until you have a square heel flap, or it measures H from top to bottom without stretching, whichever is longer. End with Row 2 and turn work so right side faces you. Row 1: Knit T stitches, then knit 3 more (the center 3 of the heel). Slip the next 1, knit 1, pass slipped stitch over. Knit 1 more stitch, turn work. Row 2: Slip the first stitch, purl the decreased stitch, then purl 3 stitches. Purl 2 together, purl 1, turn. Row 3: Slip 1, knit to last stitch before previous turning point, slip that last stitch, knit the next 1 (just past the small gap created by turning), pass the slipped stitch over, knit 1 more stitch, turn. Row 4: Slip 1, purl to last stitch before turning gap, purl 2 together, purl 1, turn. Continue this way, repeating rows 3 and 4, slipping the first stitch of each row and decreasing together the stitches before and after the turning gaps, until you're working a complete row across all the stitches. End by knitting a right side row, leaving the yarn at the end of that row, even if there's no decreasing left. Needle 1: With right side facing, pick up stitches along the edge of the heel flap that's immediately to the left of the stitches left on the heel flap needle, starting from the bottom, approximately one stitch for every two rows in the heel flap. Knitting the first and last stitch of each heel row makes bumps along the edge to help space your picked-up stitches--about one stitch per bump. You might want another in the space between the heel flap's side and the first needle of the instep. Make a note of how many you pick up to repeat on the other side of the heel. These picked-up stitches start the gussets. Needles 2 and 3: Knit across your instep stitches (continuing in your original leg pattern if desired). Remember one instep needle has an extra stitch-move this stitch to the gusset needle it's closest to. Needle 4: Pick up the same number of stitches on the other side of the heel. Then knit half the heel stitches. If Needle 1 got the extra instep stitch, then take the center heel stitch onto Needle 4; If Needle 4 got the extra instep stitch, put the center heel stitch on Needle 1. Finish by knitting the remaining heel stitches onto Needle 1, stopping 3 stitches from the end (just before the first instep needle) to begin decreasing for the gussets. Decrease round: The last 3 stitches on Needle 1: Knit 2 together, knit 1. Continue across Needles 2 and 3 in pattern or stockinette stitch. At the beginning of Needle 4, knit 1, slip 1, knit 1, pass slipped stitch over last knit stitch, knit to end. Knit next round even. Alternate these two rounds until you have F x G stitches left on your needles. Knit even on remaining stitches until your work measures L minus 2 inches when the foot of the sock is laid flat on a surface and the knitting measured from the back of the heel to the needles. Note the number of rows knit from the picked-up stitches when the length is right. These directions are for the "round" toe, which I find wears much better than the more common "flat" toe. Count your stitches and decrease evenly if needed to reduce the total to the nearest multiple of 8. Decrease round 1: Knit 6, knit 2 together, continue this way to end of round. Knit 6 rounds plain. Decrease round 2: Knit 5, knit 2 together, continue to end of round. Knit 5 rounds plain. Decrease round 3: Knit 4, knit 2 together, continue to end of round. Knit 4 rounds plain. Continue this pattern of decreases until the overall length of the foot of the sock from the back of the heel to the needles is the same as L. Place remaining instep stitches on one needle, foot stitches on another needle (making sure number of stitches is the same on both needles), and use Kitchener stitch to weave the toe stitches together. Finish off yarn ends, and your sock is complete. Repeat for second sock. Check the socks every time they're worn to check for thin areas. If you can see through the sock, it needs to be reinforced with duplicate stitch to avoid holes forming. Be sure to keep some extra yarn in a zip-type plastic bag where you can find it again, for darning and reinforcing your socks. To wash, soak socks in warm water with enough liquid dish detergent or shampoo to make the water feel slightly slick (don't raise suds for easier rinsing). Gently rub heavily soiled areas. Drain and rinse in cool water until water runs clear (some dye may continue to run-don't worry about that, but don't put dyed socks on top of each other while drying). Roll in absorbent towel and squeeze to remove most moisture, or spin in washing machine (making sure water doesn't run onto socks and that it's spin only, no agitation). Lay flat or hang on a towel bar to dry. Some people advocate putting their wool socks through normal washing cycles in their washing machines. I have done that with a few pairs of commercial-yarn socks, and found the elasticity the sock had originally seemed to disappear quickly when machine washed, even though they were laid flat to dry. In addition, commercial laundry detergents are designed to wash primarily cotton, which likes alkali, and not wool, which is damaged by alkali. So I recommend shampoo or liquid dishwashing detergent, both of which are 'pH balanced', a euphemism for slightly acidic, which is just right for wool. Once they're thoroughly dry, store where bugs won't decide your precious handknit socks are the greatest fast food around. If the socks will be used frequently, there's probably no problem--bugs don't seem to go near items that are moved around a lot. But if you don't use them often, or they're in off-season storage, do be sure the location is bug proof. Plastic zip-type bags are pretty secure, as are boxes with no ventilation holes or cracks. A cotton bag may work, particularly if there's plenty of lavender or other strong-smelling herbs scenting the area. Just putting your socks into a drawer with cedar or lavender probably won't be good enough, unless you air the contents and refresh the herbs at least monthly. Finally, if you're still unsure about knitting socks, see this online sock tutorial, http://www.royea.net/sockdemo1.html for a truly great set of pictures describing every 'step' of sock knitting. Some of the directions might be a little different from mine--no big deal, try both and see which works better for you!